From moths to planes to kites to photos, it’s been a whirlwind of activity for me the last few months at Amy Johnson Festival. This last fortnight has been a culmination of two of the main projects I have overseen as Exhibition Co-ordinator, the first being A Flutter of Moths. We worked with local company Garth West to produce pop-out planes based on Amy’s famous Gipsy Moth Plane Jason. We sent 30 planes to every Hull and East Riding school and invited the schools to decorate the planes and send the best ones back; I’ve got to say that I was overwhelmed with planes. 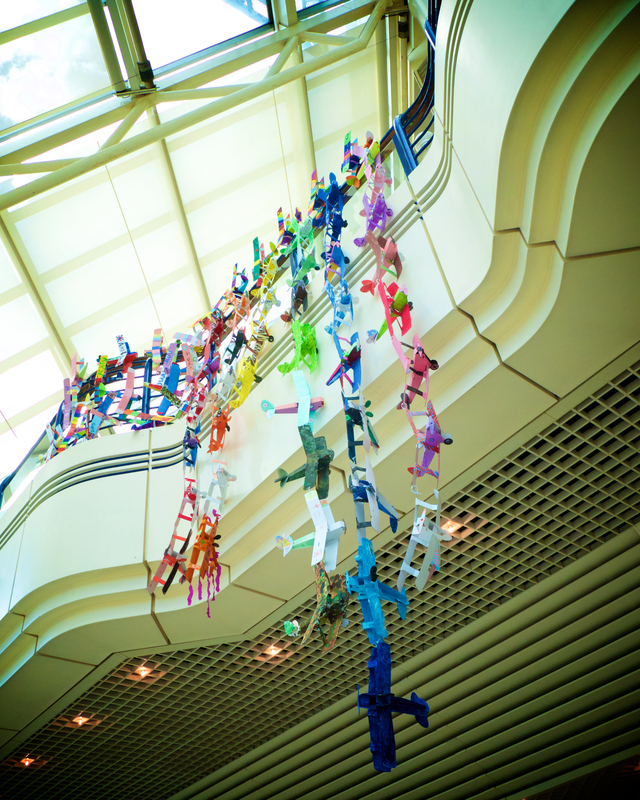 27 Schools and groups sent us back over 600 planes, and then it was on the mammoth task of curating the planes into groups that would look visually good together and working out how to hang the planes in a way that suited each venue and showcased the children’s artwork to its best potential. I couldn’t have managed it all without the invaluable help I got from the 2017 Pioneers who must have tied on literally miles of fishing line to the planes to hang them, our wonderful admin Nicky, Gold- our Security Guard, Bridget from the gallery shop and Sarah Pennington who came along to some plane all-nighters prepping them ready to hang. So finally, all bagged up, it was on to the shopping centres to install. St Stephens, North Point, Centre, Princes Quay, Prospect Centre in Hull and Parkway Cinema in Beverley all were kind enough to host the planes and I’ve got to say were amazing in their support- hiring in machines, providing man power and space to work. I’d like to say a big shout out to Lee, Martin and Ronni at Prospect Centre, Jim, Tony, Ryan and Blake at St Stephens, Cliff and Mark at Parkway Cinema, Louise and Charlie at North Point and Sarah at Princes Quay who were all involved with the installation at each site. It might have been a big task getting them all up there, but I’m sure you’ll agree they look fantastic- and I hope the children who made them all get the chance to see theirs. The other project that launched this week was Amy Johnson – A Life in Pictures. Making the book has been a labour of love for Festival Director Rick Welton, who found and collated over 200 photographs of Amy with individual captions; the book is a treasure. Reading it’s like looking in your granny’s drawer of photos, where you discover a different side of a person you thought you knew completely. The exhibitions are spread across Hull and will give people the chance to see a different Amy to the one we all know so well as Hull’s most famous daughter. The Exhibitions, up until 3rd September are located in the Community Garden at Western Library, the Library at Freedom Centre, Hull History Centre and Artlink, and each are collated into a different aspect of Amy’s life, Childhood, Leisure, Hull and her Solo Flight to Australia. Again, the help I’ve had installing these exhibitions has been spectacular- so thank you Catherine and Paul at Western Library, Andrew Quinn at Artlink, Danielle at Freedom Centre, Martin at History Centre and Rick, who just loves to roll up his sleeves and get involved. Excitingly, all the individual exhibitions will join together at Hull University along with another set of unseen photos on 6th September, staying there until the end of the festival.